The seven product categories include inputs for the auto sector and rebar used in residential construction. The government said in June it had three categories in mind, prompting companies to call for a more extensive list to be included. Canada will now consider whether additional products beyond the seven should be added. The moves would be part of the widening impact from President Donald Trump’s trade battles, which resulted in U.S. tariffs of 25 per cent on steel and 10 per cent on aluminum that were imposed on Canada, the European Union and other nations in June. 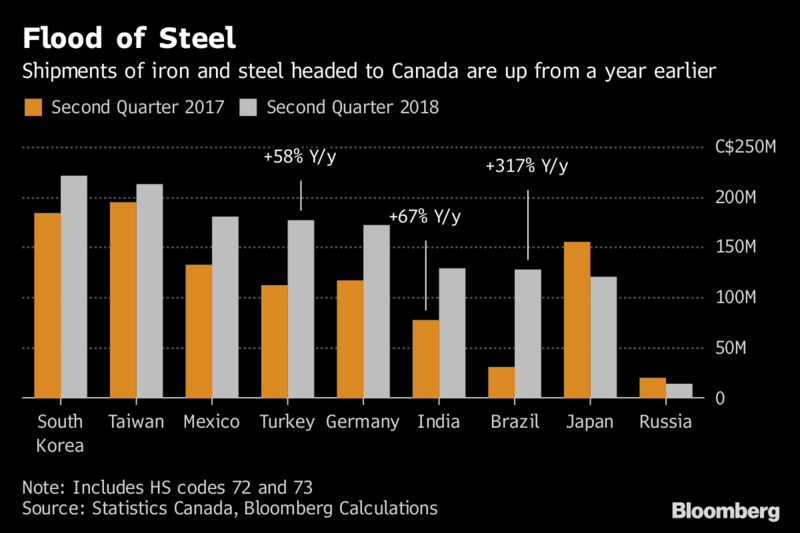 Bloomberg reported in June the Canadian government was preparing new measures including a combination of quotas and tariffs targeting certain countries including China to prevent them from diverting steel shipments into Canada. The EU has imposed its own provisional safeguards to ward off steel that might otherwise have been sent to the U.S. Canada produced 13.7 million tonnes of iron and steel products last year, less than one percent of total global production. The head of a major Canadian steel group said measures by other countries should force Canada’s hand to protect its sector. Some steel importers and fabricators have been pushing back on any potential safeguards, arguing they will negatively impact the Canadian economy and raise costs in sectors including housing or infrastructure. The safeguard could be a tariff that applies only to imports that exceed a certain target volume, similar to a format used by the EU, according to a notice from Canada’s finance department.